To respond to growing needs for high-quality elevation data, the 3D Elevation Program (3DEP) is systematically collecting 3D elevation data during an 8-year period in the form of light detection and ranging (lidar) data over the conterminous United States, Hawaii, and the U.S. territories. 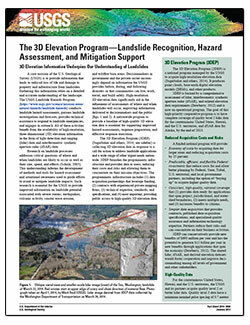 The BAA provides detailed information on how to partner with the USGS and other Federal agencies to acquire high-quality 3D Elevation data. 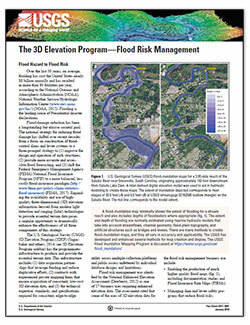 Carswell, W.J., Jr., and Lukas, Vicki, 2018, The 3D Elevation Program—Flood risk management: U.S. Geological Survey Fact Sheet 2017-3081, 6 p., https://doi.org/10.3133/fs20173081. Thatcher, Cindy A.; Heidemann, Hans Karl; Stoker, Jason M.; Eldridge, Diane F.
Thatcher, C.A., Heidemann, H.K., Stoker, J.M., and Eldridge, D.F., 2017, The 3D Elevation Program national indexing scheme: U.S. Geological Survey Fact Sheet 2017-3073, 2 p., https://doi.org/10.3133/fs20173073. 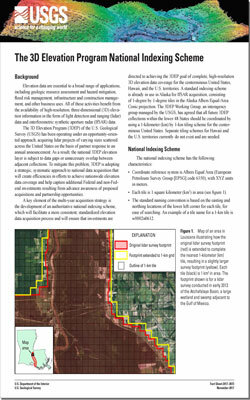 Lukas, Vicki; Carswell, Jr., William J.
Lukas, Vicki, and Carswell, W.J., Jr., 2017, The 3D Elevation Program—Landslide recognition, hazard assessment, and mitigation support: U.S. Geological Survey Fact Sheet 2016–3094, 2 p., https://doi.org/10.3133/fs20163094.